UN-Arab League peace envoy Kofi Annan left Damascus on Sunday without managing to secure an accord to end bloodletting in Syria, as fighting raged in major flashpoints leaving dozens more dead. Annan departed at the end of a two-day mission during which he said he presented President Bashar al-Assad with "concrete proposals" to halt unrest monitors say has claimed more than 8,500 lives since March last year. On the ground however, more than 150 people -- 61 of them civilians caught in the crossfire -- have been killed in two days of clashes between armed rebels and regular soldiers, according to figures of rights monitors. Most of the deaths occurred in an ferocious assault by regime forces against rebel bastions in the northwestern Idlib province, the Syrian Observatory for Human Rights said, adding that fighting also occurred Sunday in the central city of Hama, the nearby province of Homs, and in the Damascus countryside. Annan on his first mission to Syria to attempt to secure a halt to the violence, had emerged positive from talks on Sunday with Assad, a follow-up to their first meeting the previous day. "It's going to be tough, it's going to be difficult, but we have to have hope. I am optimistic," Annan told reporters, while stressing the urgency of finding a solution. "The situation is so bad and so dangerous that all of us cannot afford to fail," the former UN chief warned, in response to a suggestion that dialogue with the government was futile. Assad had insisted during their first meeting on Saturday there would be no dialogue until the "terrorist groups" he claims are fomenting the violence are disbanded. Opposition figures in their meeting with Annan however were adamant that the regime troops pressing the crackdown on dissent must first return to barracks before talks can begin. Diplomats at the United Nations in New York had expressed pessimism about the prospects for Annan's mission after troops poured into Idlib city, which lies in the province by the same name, late on Saturday just hours after his first meeting with Assad. 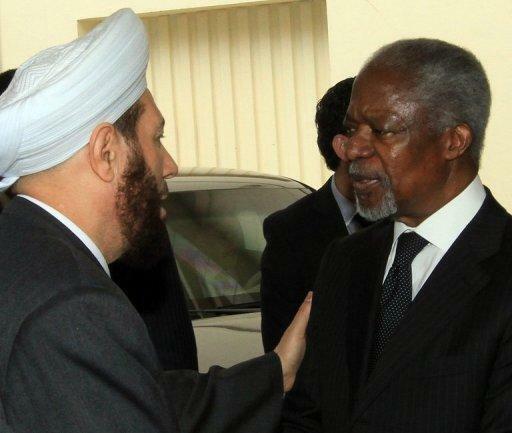 Annan told the media conference that he had on Sunday discussed with Assad ways to halt the unrest rocking Syria. "I presented a set of concrete proposals which would have a real impact on the situation on the ground and which will help launch a process aimed at putting an end to this crisis," the former UN chief said. "The realistic response is to embrace change and reforms," he added. On Sunday, at least another 58 people were killed in violence across Syria, including 17 civilians and 12 rebels in a string of incidents in Idlib province, according to the Britain-based Observatory. It added that 17 army soldiers were killed in different parts of the country. 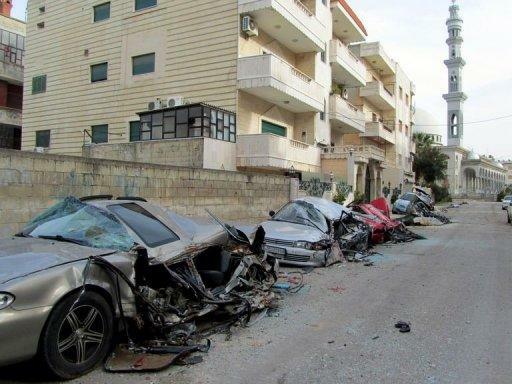 The toll added to 91 people reported killed nationwide on Saturday, among them 32 civilians. "Fierce fighting has been raging between deserters and regular army troops since (Sunday) morning in the Idlib province village of Al-Janudieh," the head of the Observatory, Rami Abdel Rahman, told AFP in Beirut. After seizing Idlib city on Saturday, troops fanned out into rural areas of the province on Sunday, notably the Jisr al-Shughur district, Abdel Rahman said. "The army is also preparing to launch an offensive against the rebel district of Jabal al-Zawiya," a range of hills close to the Turkish border, where fighters of the Free Syrian Army have been particularly active, he added. 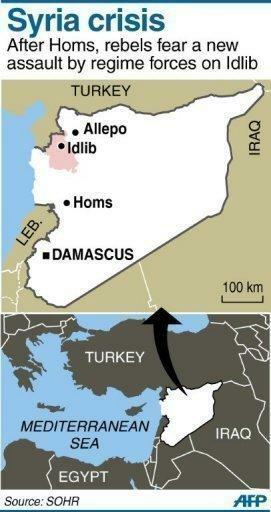 A Turkish government official said in Ankara that dozens of Syrian refugees were fleeing the assault on Idlib. At least 189 Syrians have crossed into Turkey since Saturday, the official told AFP, adding the figure tended to increase. The military crackdown in Idlib came after the Homs neighbourhood of Baba Amr was stormed on March 1 after a month-long blitz in which hundreds of people died. Ahead of a meeting on Monday that will bring together foreign ministers of the main Security Council member states, diplomats at the United Nations in New York expressed pessimism about the prospects for Annan's peace mission. "Kofi Annan's meeting in Damascus seems to have gone nowhere," said one senior envoy from a Security Council member. "Assad is determined not to give in and the divide is growing between Russia and the Western countries," the envoy said, speaking on condition of anonymity because of the sensitivity of the issue. To the anger of Arab and Western governments, Syrian allies Russia and China have twice used their powers as permanent members of the Security Council to veto resolutions condemning Damascus. Talks on a new US-led attempt to agree a resolution have hit a dead end, although US Secretary of State Hillary Clinton and Russian Foreign Minister Sergei Lavrov will meet on the sidelines of Monday's meeting in New York. UN Secretary General Ban Ki-moon, who is to brief Monday's meeting, has bluntly accused Assad's troops of using "disproportionate" force against what started out as peaceful demonstrations.